This page will tell the solution for partition resizing when you meet low disk space issue on Windows Server 2012. Download IM-Magic Partition Resizer Server to fix low disk space on system partition or data partition in Windows Server 2012. Have you ever encountered low disk space problem on Windows Server 2012? You can fix low disk space on Windows Server 2012 by relying on IM-Magic Partition Resizer Server, which is a professional partition tool for Windows Servers to resize hard disk. This partition software has the function of extending partition, shrinking partition and moving partition without touching any original data. This partition software enables you to resize partition Windows server 2012 to fix low disk space problem on any of partition without repartitioning hard disk or reinstalling system. You need to move the unallocated space close to the partition which runs on low disk space. 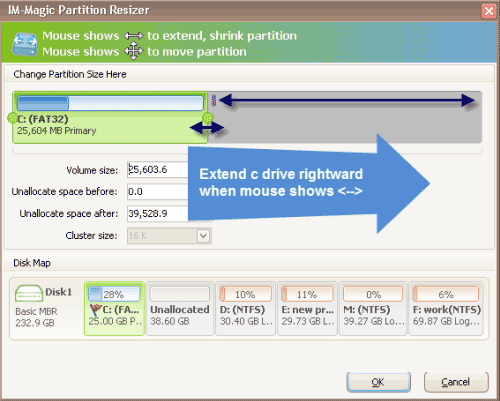 Then, right click this partition and choose "Resize/Move" option. "There are two partition on my computer which runs Windows Server 2012, but the problem is that the C drive is running out of disk space. I do not want to reinstall system and repartition hard disk because there is lots of important data on the C drive. I want to know if there is any way to resize C drive on Windows Server 2012 without repartitioning hard disk or reinstalling system. Can somebody give me any advice?" "I need to repair low disk space on Windows Server 2012 RAID 5. Recently, when I boot my PC, system will report a low disk space warning message on C drive on RAID 5 array. I know I can rebuild the array to reallocate disk space, but it is difficult for me to backup all data stored on the RAID 5 because I do not have any other storage device for backup. 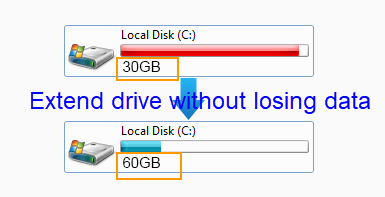 Is there a way to resize C drive on RAID 5 on Windows 2012 without touching any data?" You may wonder if you need to reinstall system when C drive is running out of disk space on Windows Server. If you can use IM-Magic Partition Resizer Server, you are able to fix low disk space on C drive on Windows Server 2012 without reinstalling system. This partition software allows you to redistribute hard disk and reallocate disk space easily with several simple steps. Generally speaking, this partition software helps fix low disk space problem on C drive on Windows Server 2012 by moving free space from other partition on the same hard disk. RAID 5 array is dynamic disk which has some difference compared with basic hard disk, but the IM-Magic Partition Resizer Server can work on RAID 5 perfectly to help resize the disk. By using this partition software, you can extend C drive on RAID 5 by moving free space from other partition on the array. If there is no free space on other partition, you can also add new disk which will show as unallocated space on the array, so you can move the unallocated space to C drive to get it extended. Whether you need to add new disk or not, this partition software enables you to resize RAID 5 without rebuilding the array or deleting any data from the array. IM-Magic Partition Resizer Serve can not only help fix low disk space on C drive, but also it can help resize data volume when it runs on low disk space. You can resize C drive or data partition with original data untouched, so you have no need to backup data or move data. This partition software provides an easy and secure method to resize hard disk on Windows Server 2012. As a professional partition tool, this partition software can also be compatible with other Windows Server operating system such as Windows 2003, Windows 2008, Windows SBS and Windows Server R2.